We know teeth straightening doesn’t sound like fun. But the first time you look in the mirror at your new beautiful smile, it will all be worth it. Invisalign® is the world’s original and most advanced clear aligner system. If the thought of metal braces is holding you back from seeking orthodontic treatment, we want you to know there’s a better way with clear aligner therapy. Aligners are removable so there are no dietary restrictions and hygiene routines can be kept up as normal. Compliance indicators fade from blue to clear to keep their treatment on track. Replacement aligners sent at no additional cost if they happen to lose them. Removable aligners don’t get in the way of their active lifestyle and sports. Time to consider teeth straightening for your teen? We also offer Invisalign Teen® so they can avoid the embarrassment of metal braces. Our patients have achieved stunning results with Invisalign! Contact your Brooklyn Invisalign dentists, Drs. Lee, Yoon, or Lorenzo at Park Slope Dental today to schedule a consultation and get started! Traditional orthodontic treatment plans often require extractions and/or the use of palatal expanders to create more space for tooth movement. This method is more invasive and therefore more painful, can extend treatment times, and create a narrower arch and flatter profile. The Damon system uses light, biologically-sensible forces to create fuller, more natural smiles. 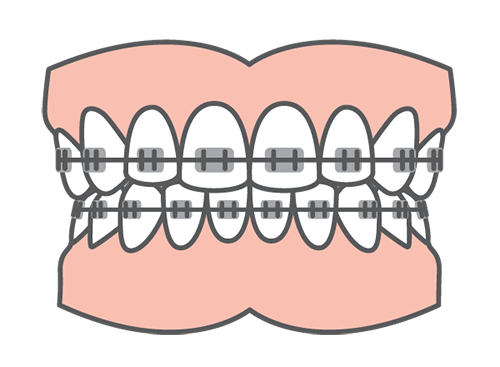 Self-litigating (sliding) braces eliminate the need for elastic bands, metal ties, or tightening. High-tech, lightweight shape-memory wires move teeth faster with fewer adjustments. Fuller smiles and facial aesthetics are achieved without extractions or palatal expanders. Damon braces deliver faster treatments, fewer appointments, improved comfort, and consistently high-quality results. Traditional metal braces get a bad rap, but they’re still the most tried and trusted teeth straightening method available, and we can provide all your orthodontic care from the comfort of your dental home. Braces have made some improvements in recent years—materials are lighter and more discreet, and treatments can be completed quicker than ever. Correct complex bite problems and create movement along the vertical axis. Centuries of refinement creates results that are dramatic and predictable. Improved oral health and self-esteem are well worth undergoing treatment. Traditional braces can correct any and all malocclusion cases, so if you’re not a candidate for Invisalign, we can still straighten you up! We’ll let these straightened smiles speak for themselves! We would love to be the team to help you straighten your smile. Contact us today for a comprehensive consultation to get started! In the past, a recommendation for braces came with a 2-3-year sentence, guaranteed. Today, with the help of advanced technology like Propel, we can completely straighten your smile in one year or less! Propel utilizes high-frequency vibrations and/or manual osteoperforations or “dental dimples” to dramatically increase the rate of tooth movement. Quick and convenient treatment with your regular orthodontic check-ups. Cut average treatment times in half with Propel accelerated orthodontics. Achieve the results you desire faster than ever with minimal discomfort. Whether you have an important upcoming event, or you just want straight teeth—like, now!—Propel can shave months off your treatment time. Don’t put off your best self another day. Get started on a new smile and a new you today! All it takes is a phone call to get started—and the consultation is on us!